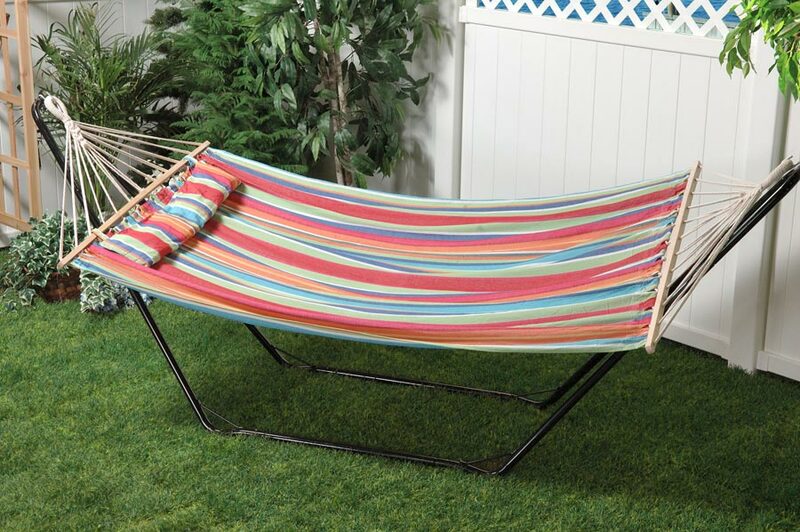 This beautiful tropical striped Bliss hammock with pillow and spreader bar is made of strong, breathable colorfast cotton / polyester fabric to help withstand the elements. You will love the comfort of the attached pillow to increase the relaxation. *Included 40" wide pillow & velcro straps attaches to spreader bar. *No assembly needed. Easy to hang with included 2 foot long chains & S hooks. *Thick rope loops are reinforced with steel on the inside. *Wide bed size holds up to 265 lbs.